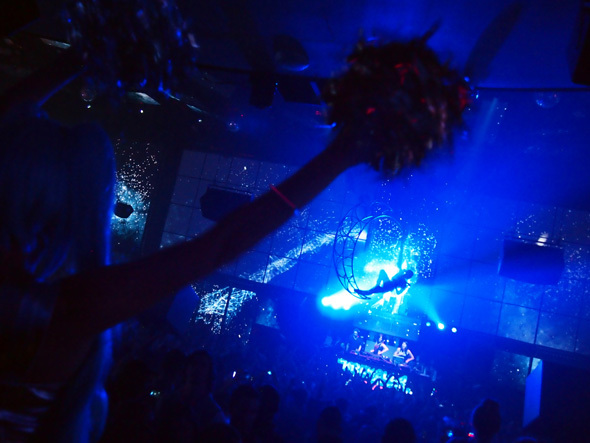 On New Year’s Eve, LIGHT Nightclub, the first-ever nightclub by the creative minds behind Cirque du Soleil in Las Vegas (Mandalay Bay Resort & Casino), launched new designs by renowned Fashion-Tech Designer Anouk Wipprecht as a celebratory crowd rang in 2014. LIGHT Nightclub is known to combine cutting edge technology with out-of-this-world aesthetics, and as such, they invited Anouk to explore her work on wearable electronics and experiment with a set of technology-equipped, coordinated performance pieces to enhance the Cirque du Soleil experience. In turn, Anouk integrated techno-teasing and interactivity into her creations to compliment the mindset that Cirque du Soleil stages. 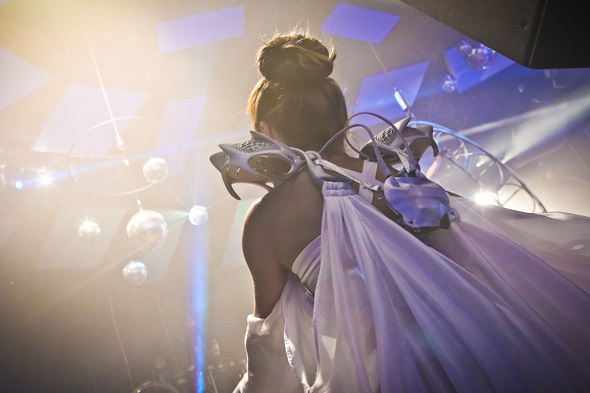 On New Year’s Eve, her effect-based designs found their match in the technical marvel that surrounded the nightclub. Among these designs were elements designed in collaboration with Italian architect Niccolo Casas and 3D printed by Materialise. This event marked the second collaboration between Anouk Wipprecht, Niccolo Casas and Materialise (the first being the Smoke Dress) and continued Anouk and Niccolo’s study on how to combine the body and technology with 3D Printing. The 3D printed elements were brought to life through Laser Sintering and hosted four independently controlled shoulder pieces with strobe-effect 20W High Power LEDs shining through the shape. With wireless synchronisation as part of the animation control system, Anouk and her team (Matt Pinner and Daniel Schatzmayr) developed an independent interface based on custom made PCB boards connected with an network adaptor to a credit-card-sized Linux-based Beagle Bone. All together, this simplified the rapid deployment process by having an minimum power footprint. 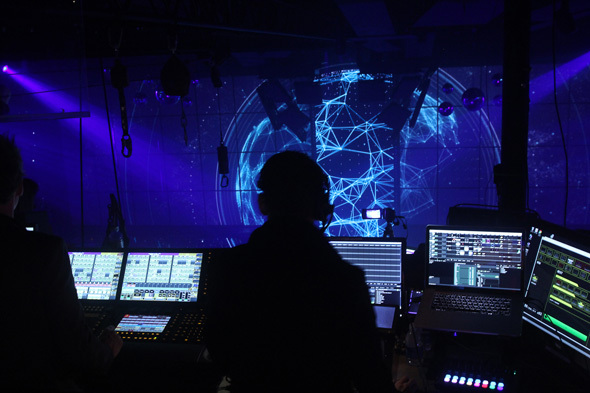 TouchOSC (Beagle Bone uses Android 4.0) enabled the designs to be controlled within the unpredictable realms of the tunes and beats of the venue. Additional images of the pieces, the protoboards and the PCB layout (Eagle) can be found on Anouk Wipprecht’s Facebook page.